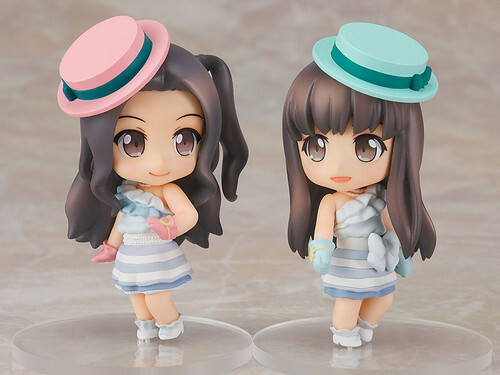 The popular idol unit ‘ClariS’, known for singing the opening songs to popular anime series such as ‘Ore no Imouto ga Konnani Kawaii Wake ga Nai’ and ‘Puella Magi Madoka Magica’ is getting the Nendoroid Petite treatment! This version is based on the ClariS girls as illustrated by Hiro Kanzaki for their debut single, ‘irony’. The set will also come with a special stand that will let you display them on top of the CD case! You can have the ClariS girls by your side whenever you listen to ‘irony’, or their new single – ‘nexus’! This Petit set is scheduled for January 2012 release with a price tag of 1500 Yen. Indeed! For Petites they are looking pretty good. Anyone know where to pre-order?